Once you have created an account, you can begin creating your performing groups. On your Director Overview page, you will see columns for each group type you can create: Drum Corps, Marching Band, Color Guard, and Drumline. To begin creating a group, click the Create Group button in the appropriate column. From here, you will be asked to fill out a name for your group, and optionally enter a Hometown and description. When you click Submit, your group will be created! You will notice that the button on your Director Overview now says "Audition Performers". 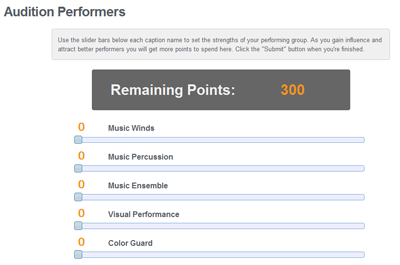 When you click this button, you will be sent to a screen with several slider bars for that group's score captions. These bars represent the strengths of your auditioning players. Simply slide these bars to adjust the overall abilities of your auditions. The maximum number of points you can use is displayed in the gray box. Finally, the button on your Director Overview changes to "Design Show". On this page, there are fields to name your show and its repertoire/movements. The most important part of this page, however, is setting your challenge levels. On the most basic level, challenge levels represent the complexity and difficulty of your show. Each part of the show has its own challenge level setting. For more information, you can read the gray box on the Show Design page, or view the Show Design page of the Game Guide.